Game I'm building using Unity engine. im working on figuring that out also seems all the unity assets store has is animation packages for people not for tanks so this might take me a while. Here's where im at now. me too, me too.... freakin' capsules..
Nice map. Maybe this summer I'll make one. Hum until I learn how to make the tanks move I will just be making maps will start work on a island map tomorrow. 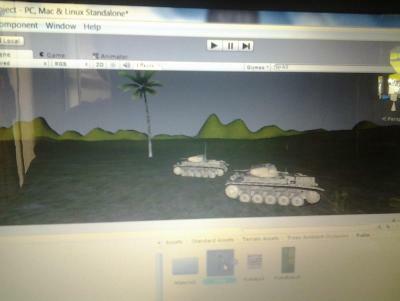 how did you make tanks and terrains? Hum we will need to discuss that in a personal message it will take a while lol. Sooooo how will you put it in the game? im not working for GHOR (map building wise) this is just something im doing on my own. You should send it to them. Tell them to put it in the game. That was just my test map im working on a better one right now. Well when your done, you should send it to them. Say put it in the game.